For quite some time, SQLAlchemy has been my go-to database toolkit and ORM for Python microservices and Serverless projects. 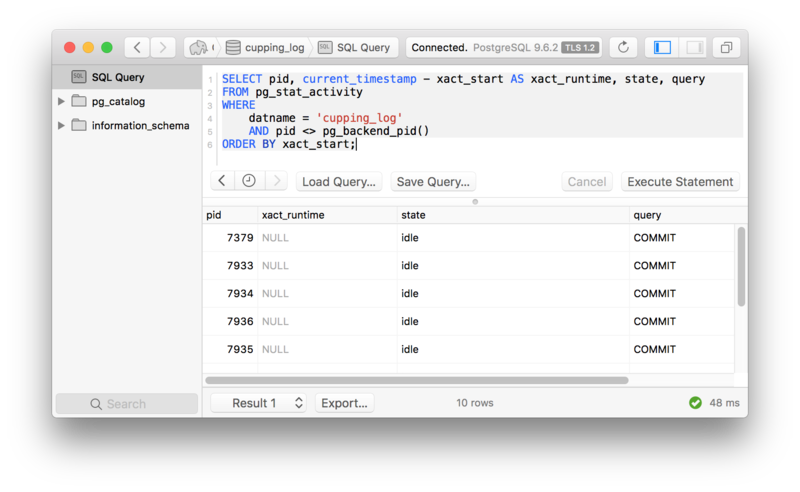 SQLAlchemy is very powerful and has given me the ability to do pretty much anything I need to do with Postgres, my database of choice nowadays. Of course, the trade off of great power and flexibility is increased complexity. Since SQLAlchemy is a bit more low-level than other ORMs (such as Django, or even Flask’s layer on top of SQLAlchemy) you’re on the hook for dealing with some details that these other ORMs handle automatically. 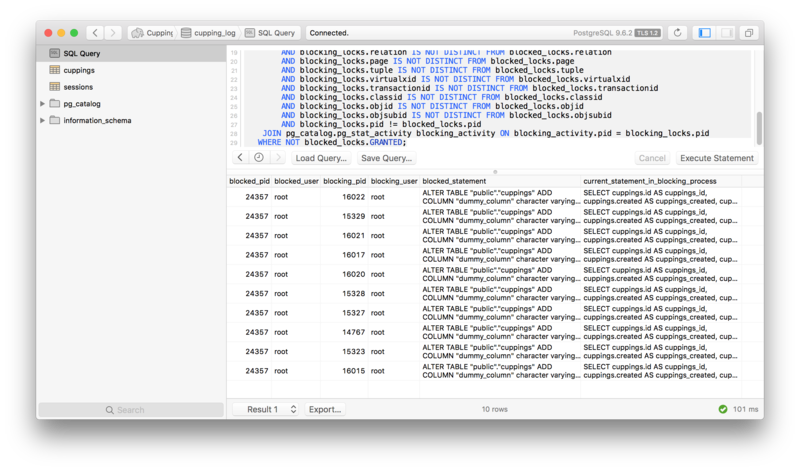 In this post, I’m going to discuss how to manage database transactions in a serverless environment using SQLAlchemy correctly. I’m not going to go into great detail about DB transactions themselves. However, I will remind readers that it’s crucial to close transactions by either executing a DB COMMIT or ROLLBACK statement. If either of these is not performed after a transaction is started, a database connection will wind up in an idle state and can block other types of DB operations. I’ll go into more detail below. Because web frameworks are designed to deal with the web, they can depend on this request/response cycle and offer hooks to us engineers. As a simple example, when a database is brought into the picture, we can connect and disconnect in logical places such as pre-request and post-response, respectively. Any database connection setup would, of course, be started early on in the request pipeline, and tasks such as closing a connection or putting a connection back into a pool would be near or at the very end. A post-response hook is a fantastic place to also commit transactions, or perform a rollback in the case of errors. Either way, it’s a logical place to tidy up DB transactions and connections so that the DB is left is a “clean” state at the end of an HTTP request/response cycle. Serverless architectures do not provide us with these simple hooks. The problem lies in the fact that functions-as-a-service (such as AWS Lambda) are so simple. What I mean here is that web frameworks do quite a bit of work for us and are relatively complicated pieces of software. Lambda functions or other FaaS are much more straightforward and provide next to nothing out of the box. In a genuine sense, they are small functions which execute on our behalf in response to some event. This event may or may not be an HTTP request. When a Lambda function executes in response to an HTTP event, all of a sudden we’re in a situation where it’d be pretty nice to have some of the typical lifecycle hooks found in modern web frameworks so that we can clean up DB connections and transactions. How do you properly use SQLAlchemy when you don’t have lifecycle hooks to setup and tear-down/close your database connections and commit/rollback transactions? Before answering that question, let’s look at what happens when you mishandle DB transactions. It took me quite a while to figure out that I was managing my DB transactions incorrectly in all of my serverless projects. The reason has to do with both the way I structured my code for transaction management in combination with SQLAlchemy’s design. I’m not at all blaming SQLAlchemy…my code was simply assuming a particular behavior that SQLAlchemy doesn’t conform to. The code and pattern below is something I’ve been using for years, across serverless and non-serverless projects. It’s critical to understand that SQLAlchemy will implicitly start a transaction whenever you starting making ORM queries or statements. As such, you need to commit or rollback these transactions yourself. I have a mixin class which adds a save() method that will do the work of committing the transaction. """Model for the clients table.""" To use this, I can first create a User and call the save method to get the object/record committed to the DB. The following would start and commit a transaction just fine. Now, all is well. However, if you add one more line after the save, a new transaction would be started. Follow the common scenario below of writing something to the DB, then immediately using the ORM object which was written. # commit_session # helper. Life is good. # the database! This means that a *new* transaction has been started. you have started a second transaction in step 2 and needs to commit it. 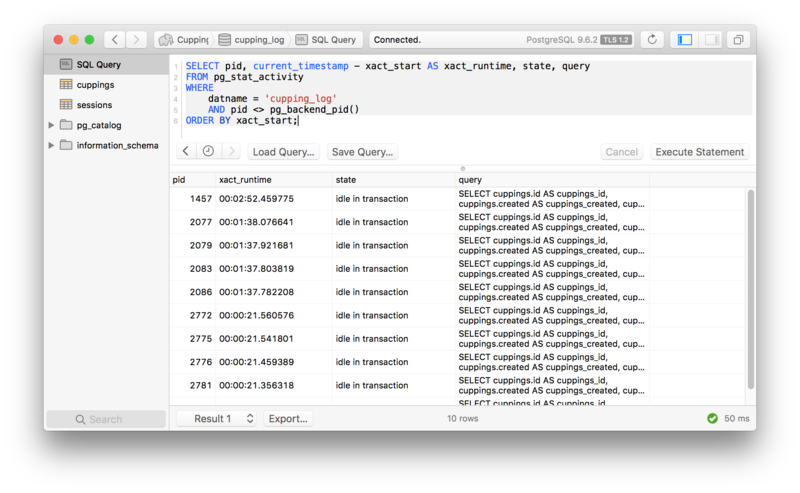 The act of asking for data from thing would start an entirely new transaction, as SQLAlchemy will go back into the DB to get the data which was written. The end result is that transactions were left lying around in an idle in transaction state. The subsequent request to my Lambda functions would work just fine since these connections would start all over again with new BEGIN and COMMIT statements. Eventually, the connections would be committed, or timeout as the Lambda functions was expired by AWS. The same problem exists for my read-only handlers. When reading data, I did not have any transaction management which resulted in the same problem. Even if there is a COMMIT statement around get_thing_from_db, the last line will open up a new transaction which isn’t committed. The worse problem here is when performing any type of database schema changes. Look at the table here from Citusdata which explains what statements will block other statements. In the top row, you will see that SELECT statements will block ALTER statements. The results above show that my 10 open connections are all idle with SELECT statements, and each of these is blocking my ALTER table statement. """Decorator to commit the DB session. With this change, after running siege I can see that connections have gone from idle in transaction to simple idle, which means the connection is open but the transaction has be closed. Managing database transactions manually is tricky whether you’re using a serverless architecture or not. We often take for granted all of the work which web frameworks provide to us and it can be a rude awakening when we have to deal with housekeeping issues like this ourselves. Still, I believe well-rounded engineers need to understand what is going on with the systems that we use. While SQLAlchemy may be a bit more “raw” than some of the other ORMs out there, it’s extremely powerful and provides you the ability to do nearly anything you need to do. There is another subject buried in here which has to do with connection pooling in serverless architectures. I plan on covering that in an upcoming post.